It’s been a crazy month at Halcyon Acres®. We spent much of it struggling to get temporary water to the house, trucking it in to the farm and figuring out a fix. Last week we were finally able to get an available backhoe in here to dig a new water line. Might sound like a simple task, but wasn’t. Diagnosing the problem took a while. First, we suspected the well was dry (we’ve been dealing with horrible drought conditions here). Seemed odd given the super producing underground stream, but I can’t recall a time when we’ve had so little rain fall coupled with high heat. It wasn’t the well. Good news on the biggest problem front, but not so much on the ‘when will water flow’ question. Ultimately, we determined it the line. By the end of the week a temporary fix was rigged. The problem was, we were asking a pump that was already working pretty hard to draw a longer distance and up an extra five feet of height. Holding the prime became a challenge. It was enough water to brush teeth, flush toilets, wash dishes and take rapid showers – all spaced throughout the day to put as little stress on the pump as possible – but we’ve been trucking water in for everything else. The backhoe was a bigger challenge. The narrow, steep terrain, shale (and a foundation, as it turned out) and mud (getting to the well required digging through this productive underground stream) required a gutsy yet agile machine. Seventy-five percent of the organic produce crop is gone. We had to resort to some insecticide treatment in the end. The rain dances have paid off and water is flowing again at the farm. Funny, I never realized how much I depended on water for most waking moments of my life. Now I do. It’s wonderful to find a new appreciation for something most of us take for granted. Sweet Dixie charmed her rider who was aboard her for the first time. This past month marked the hire of an assistant trainer. It took a while to find someone qualified. Many applicants had been riding a long time, but didn’t know how to do much more than be a passenger. Ultimately, we settled on a gal who was kind with the crew, had enough experience to be able to work with some of the greener horses and could operate independently. She set the compensation rate and her hours. 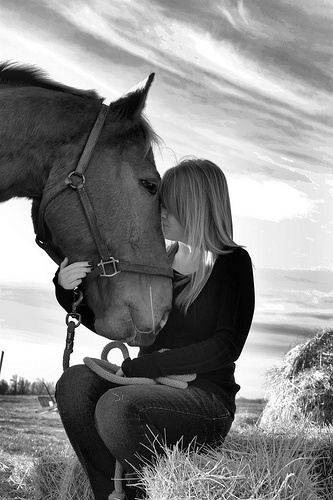 She loved the horses, was awed by the beauty of the property and enjoyed the job. She pulled a no-show after a week’s time and later quit via an e-mail message claiming time constraints. My wonderful vet stepped up and offered to lend a hand. This week we videotaped some of the kid-friendly stock under saddle and captured a bunch of conformation shots of others. Advertising will commence in the coming weeks. I was also put back in touch with a lovely young rider/trainer in South Carolina. Some of the horses will be shipping down there for polishing and rehoming. Remi’s stepped up and is trying to lend a bit of a hand with the horses in Gatsby’s absence. None of the horses have taken on Redford’s role. Crooked (she’s not any more – probably should come up with a new nickname) continues to grow and show how clever she is. 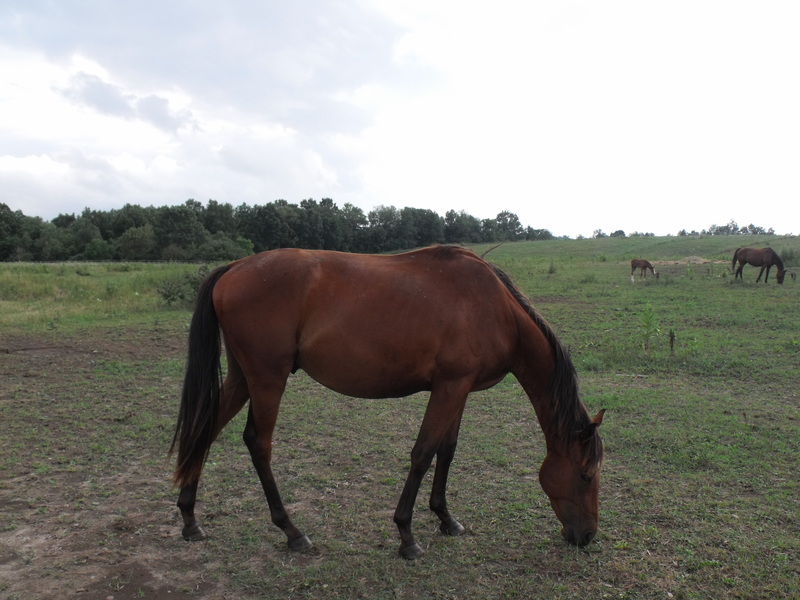 She’s probably close to 15.3hh at only a year old and has a lot more growing to do. Her new game is to eat grass only on the outside of the fence. We’ve been doing a lot of work around here so the fence has been off. She knows it. Cute little Midge is so much fun. You can see how intense she is in this shot. Einstein has a different approach. He’s a jumper. Of course, he can’t seem to figure out he can get back in the same way he left. At least once a week I hear thundering hoofs and screaming through my office window. Fortunately, he knows where the primary entry spot is so it’s a merely matter of calling him and swinging open the gate, then watching him whoosh down the hill, corner the ninety degree turn at 35 mph and gallop full speed to the herd hollering all the way. Midge hasn’t lost her spark. She’s loving being back in training. Riding her again is bringing back the old memories on what attracted me so much to this delightful mare. It’s so funny to witness her energy, enthusiasm and stamina. She’s game for anything, handy as can be and always ready to go, go, go. You can feel her smiling through every request and especially the new challenges. Dixie is a gem. She was one of our video-taping projects. My vet couldn’t get over how sweet she was. This is another gal that was put back into training after a long hiatus. I forgot she’d never been ridden at the farm. 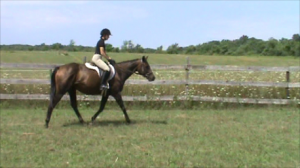 She handled mounting with a stirrup and the trails like an old pro. On the young horse training front, Judie’s old-soul mentality makes her one of the steadiest and easier horses on the trails. She seems to enjoy quiet rides alone. She comes running when she’s called and relishes her individual attention. As one that’s relatively low in the herd ranks, she appreciates a new routine that has her in the barn during the day. Clover and Leah are back in training too – both sharp little gals who pretty much started back right where we left off last year. The herd’s starting to segregate. They were running as a band together until recently. It’s interesting to watch the dynamics. Sometimes you can learn more about a horse by watching how they interact with other equines than you can through direct contact. Hope you all are enjoying the seasons and the horses that make them so interesting. Of course, this is a greedy list for one, but bet I there are more than twenty-one people who are wishing for the same as winter attacks (sans the Leah request, of course). How about we each ask for one and suggest Santa share the gifts with all? What do you all think? Have more to add? It shouldn’t be hard to find additional supporters to spread the spirit if you want to add to the list. Yep, this is a bit of horse humor, but imagine the answers may be among readers of his blog.Please offer your deepest desire in the comments below as it relates to horses and we’ll see if we can’t build some Santa support (and will probably get some good advice from the readers with ideas to help make our wishes come true). Many of you have been asking for this (particularly overseas, although we do have distributors in the UK and EU), and I’ve been remiss in not announcing this earlier – sorry. The Turning Challenging Horses Into Willing Partners book is available as a Kindle edition for $9.95. It’s a great Christmas gift for the horse lover in your life if you’re a last-minute shopper. Fall brings burdocks. If you’re removing these nasty buggers from the forelock, put a fly mask on before you start. If even only one of these small hooked seeds gets into a horse’s eye, you’ll likely be dealing with weeks of medical treatment and associated vet bills to resolve the irritation and likely associated infection. Don’t learn this lesson the hard way assuming your horse will remain perfectly still as you try to rip them out. Do fecals after the first hard frost. This way, you can ensure your horse is either worm free, or apply a customized solution to any parasites that may be an issue. Regular worming regimens are no longer endorsed by the majority of equine professionals due to documented concerns of resistance and unnecessary chemical introduction to the equine body. Still, it’s critical for your horse’s health (as they approach the hard winter months) to ensure they’re not also feeding uninvited residents. Do a blood or hair test to determine if there are any nutrient imbalances or toxins invading your horses body and customize an associated supplement solution to address this before hard winter hits. It’s easy (albeit expensive) to ask your friends or colleagues about what supplements they’ve found most effective. The fact is, unless you understand what your particular horse’s issues are, you can’t determine what they need to be healthy. In fact, supplementing indiscriminately can do a lot more harm than good. We discovered two surprising results from tests recently at Halcyon Acres®. 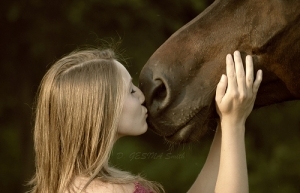 High magnesium and selenium levels in all horses tested. Ordinarily these would be things you’d supplement as a matter of course, but doing such here could have been deadly. Survey your horses to ensure they are at a good weight. 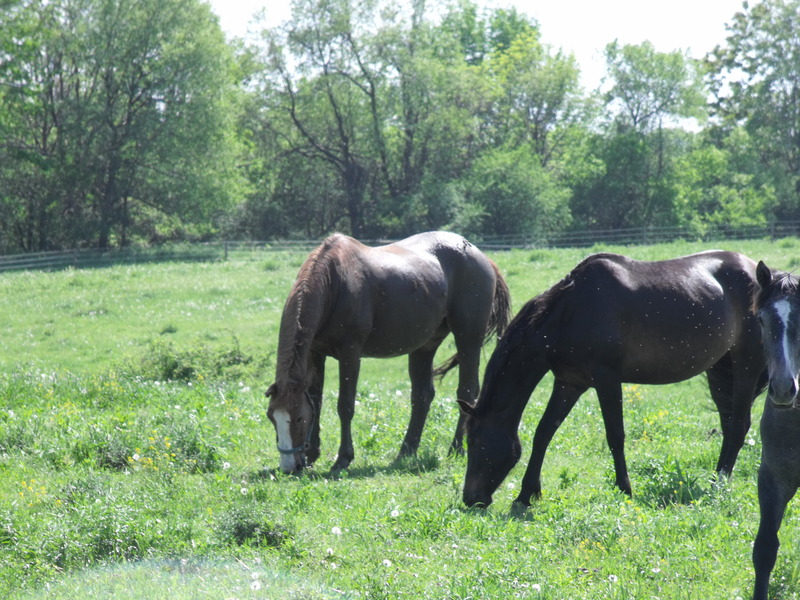 For hot blooded horses, broodmares, foals and outdoor residents, it’s best to have them a little on the heavy side before their bodies need to work overtime to generate heat. Now’s the time to help them put on a little extra to prepare for the cold. Keep the blankets off for as long as possible. You’re not doing your horse a favor by ‘keeping them warm’ during dropping fall temperatures. 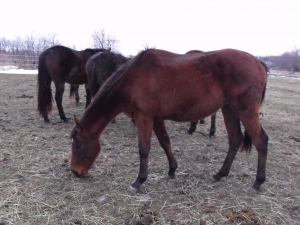 Let them grow a natural coat and reserve blanketing for those who can’t handle the cold after their hair has grown (usually older horses or those too unhealthy to grow an adequate protective layer). 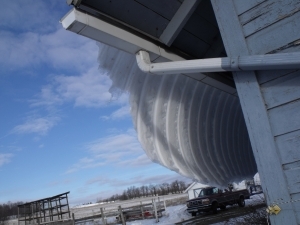 Ensure all horses have shelter from wind and cold rains. Healthy horses can handle snow a lot easier than they can rain and winds. If you don’t allow escape from wet and winds, you’ll likely head into winter with a skinny horse that will only get thinner as temperatures drop. 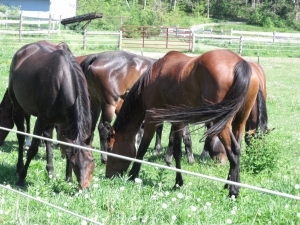 Find a hay supplier that can get you through the winter or get enough in your barn to keep horses munching until spring. Good quality hay in ample amounts (read constant supply) can do a lot to keep your horse healthy through the cold winter (or any other time of year if grass isn’t available). Don’t wait until winter hits to wonder if you’ll have enough. Design water delivery systems that keep your horse’s thirst at bay. Whether this is in the barn or outside, it’s critical that horses are kept adequately hydrated during winter months. Now’s the time to figure out how to make this so. 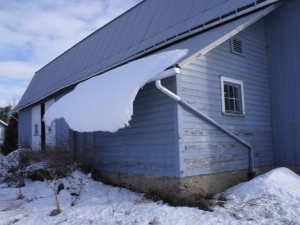 If your solution is hoses – they freeze in winter unless you remove them to warmth daily. Hydrants are good, but troughs freeze. Automatic systems are expensive, but effective. There are a number of devices sold that heat, but that requires electric and safe solutions that don’t put the equines in danger. Now’s the time to ensure you have a plan to get amply daily water to wherever your horses reside. Resolve any drainage issues to avoid ice around the barn or in the pastures. This can be as easy as a shovel and a path dug now, but is much easier to do now rather than after winter hits with associated frozen ground. 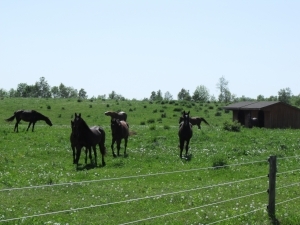 Repair and replace any pasture board, breaks in the electric line, broken or weak posts or cranky gates. You’ll thank yourself for getting this done before you have to brave driving snow, frozen ground and loose horses. 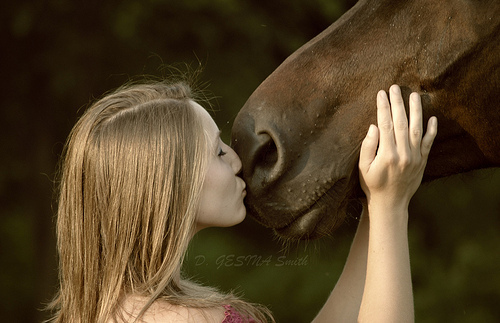 Enjoy the remaining reasonable weather for fun time with your horse. Take that extra hour off from work or miss those TV shows that have you wondering where your day went. Now’s the time to enjoy moderate temperatures, decent footing, beautiful scenery and great bonding experiences with your horse. Do you have tips you’d like to share that have helped you prepare for a better and healthier winter with your horse? Please offer them in the comments below. It’s always amazing to witness horse herd behavior – even when it involves domesticated equines. We’ve been dealing with a sad situation at Halcyon Acres® in recent weeks, but it’s been fascinating to watch how the horses are respond to these odd circumstances. A filly was born here in May out of one of our best Irish Draught Sport Horse (IDSH) producers, a mare that has always been a devoted, protective and superb mom. It’s been a difficult four weeks for mom, baby and me. We’ve been exploring using herd mechanics at Halcyon Acres® a bit in new and different ways (for us, anyway). After our spitfire colt of last year kept figuring out remarkable feats to get to the main herd and away from his mom at a very young age (jumping a 4-foot, 4-strand high-tinsel coated electric fence; managing to crawl through two-strands of interior electric without touching the wires; rolling under the fence; running through it; etc. 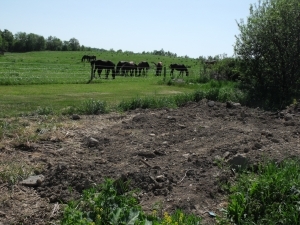 ), we decided (read gave up) it would be best to save the maiden mare the angst of being separated from her darling and turned the pair out with the farm-owned crew. He was a huge, independent and smart colt who managed to buddy up with everyone almost immediately, unscathed. 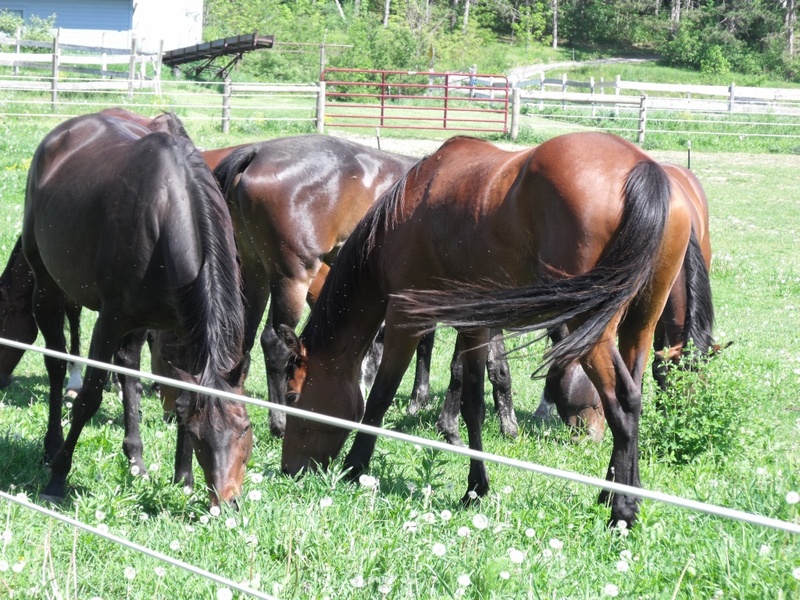 So this year, we made the decision to put our broodmares and babies out with an appropriately selected group of horses who weren’t towing a foal (or waiting for one) after a brief period of giving mare and foal time to bond. 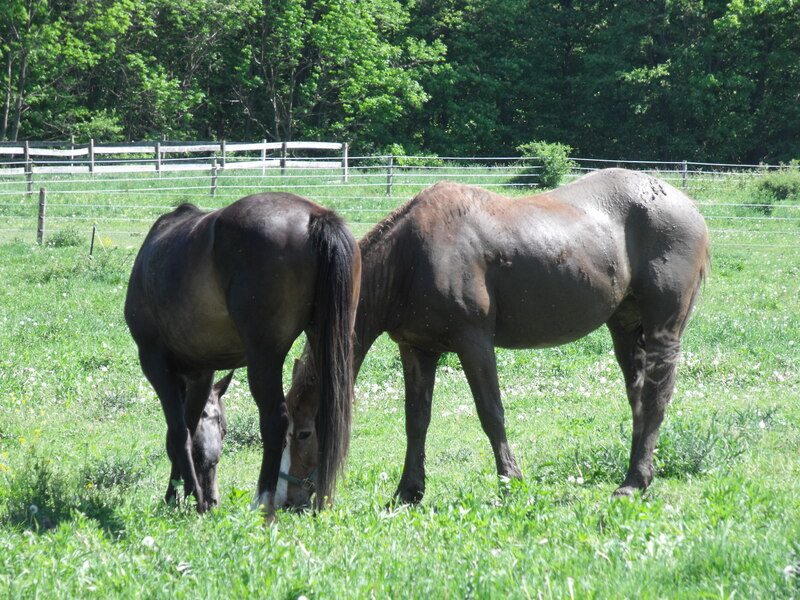 The older I get, the more I come to welcome the help other horses provide in schooling young horses – and realize how significant an imprint the right horses can make on a foal’s behavioral development. At about five days of age, Crooked (I need a better nickname for this foal – suggestions?) and her mom joined three other gals in the big digs. Right about the time we moved the pair into this segregated herd, health issues started escalating with the foal. Early on, we were focused on a localized infection near the umbilical cord (she came out of the mare with a huge stump and large hematoma right in front of the site – likely due to the cord breaking in the birthing canal) and noticed the crooked legs, but hoped they’d straighten over time. Then, she almost doubled in size in less than a week. The front tendons contracted first, next the back, which were worse. Now, most of her time is spent lying down to minimize the pain – she’s also recently been relegated to stall rest all but 2 hours of the day. Tried small paddock turnout, but the mare was so much more interested in the gals, she ran the foal ragged and knocked her down if she traversed into her tantrum path. As I write this post, a three-year-old client filly is standing at the gate screaming to the foal in the barn. This big gal spent the winter in low status with her gang of ‘babies.’ They left, so we culled out a few kind horses to keep her company. 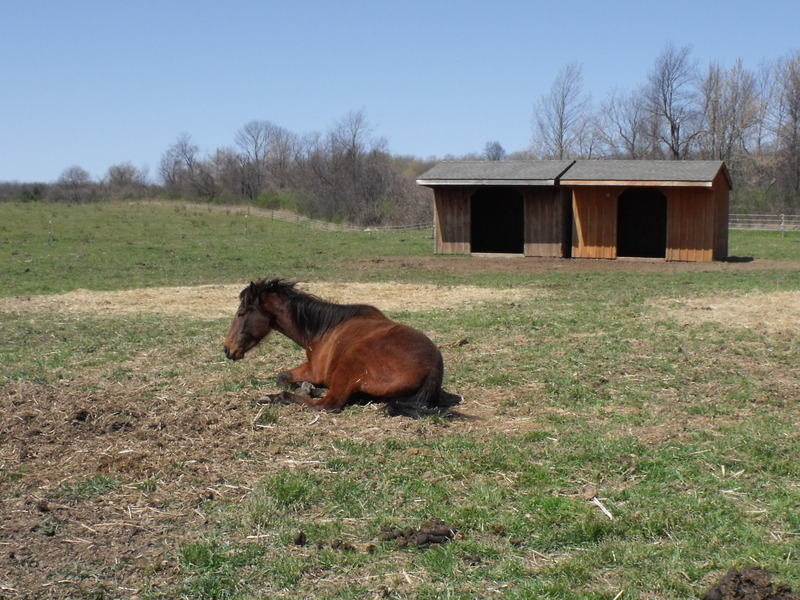 When the birth mare started to ignore, leave and reject the foal (she’s still letting her nurse, but otherwise seems to wish she were gone) this young mare kept watch over the baby as she lay in the grass for hours, resting her sore and constricted legs. Mom left the filly, heading up the hill for richer grasses – or into the barn unconcerned about her whereabouts at feed time. Funny, this nurturing role seemed to boost this filly’s confidence (and rank and popularity in the herd) in ways no grouping of horse company could. Horses do things you never expect. This mother went ballistic for the better part of a week a few years ago as I tried to remove the second twin – born alive, unlike her sister – when she died after a struggle to save her. By the time I was able to separate the dam and the carcass, she had scraped all the hair and skin off the baby in an effort to get her up. Witnessing her now ignoring a young foal because it isn’t perfect is a shock. Similarly, this three-year-old TB filly is a classic follower. Watching her take the lead in giving this foal the comfort and protection the mom failed to provide was a joy to observe. This experience will likely serve both horses well. The baby knows where the milk is, but clings to the filly for other needs. The stand-in has blossomed into a confident and expressive equine in many aspects of her existence, which should carry over into future career requests. It will be a very sad day when the two must part, but the weeks where they touched each other will likely last them a lifetime in terms of how they handle future challenges. Do you have horse stories to tell? Have you witnessed surprising behavior from horses in the herd? Please share in your comments below. 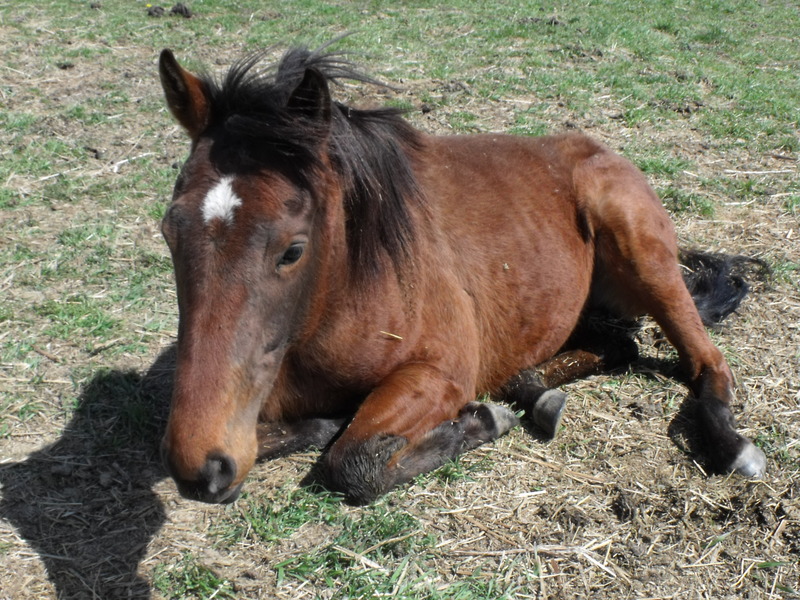 Midge is the one mare at Halcyon Acres® that has always waited for me to witness her miracle. All the others seem to prefer foaling out without an audience (so I need to be crafty about getting there in time in case there is a problem without being a disturbance as they decide they’re ready). Oddly, Midge has always been able to time her delivery when she knows I will be around. Last night I was late on my rounds (by about ½ an hour) and missed her birthing (for the first time ever – this is her sixth foal) by probably about four minutes. She’s one of these mares that goes from start of labor to a foal on the ground and the placenta passed in less than ½ hour, so it’s hard to believe it’s a coincidence that all her births coincide with when she knows I will be there. She showed no signs of an imminent birth. In fact, we even did a calcium test on her milk for the first time with low levels indicated there was no way a foal was coming any time soon. Midge didn’t wax up at all. There was no restless behavior (never is with her anyway) or indication this baby was on its way. Yet, there her newborn filly was, bloody, wet and huddled in a ball when I made my tardy appearance. This is a mare I’ve always had a special bond with. She anticipated our training time together at the track with so much enthusiasm she drew the wrath of all the grooms in the barn (digging a hole to China while getting the other horses wound up as she waited the hours before her turn – never did understand why she wasn’t put earlier in the schedule, but this was a big trainer with a system and she didn’t have a stall located at the front of the shed row). Early on, I indicated to the trainer my interest in buying her when she was done racing. My intent was to train her as a lead pony for the youngsters that come in to Halcyon Acres® for under saddle training, but sadly, she was flipped into a ditch by a violent groom on her last race day. This incident caused sight damage to the right eye (among other serious injuries). So she became a kicker because she was afraid of not being able to clearly see the horse in tow. Later, when I looked into her breeding (there was no reason to do this initially), I realized she had some super bloodlines behind for our venture into breeding Irish Draught Sport Horses. Of course, her conformation, heart (she had tons of it), size (she’s only 14.3hh – which was a plus given the size of many of the US RID studs) and beautiful head (yes, this is a factor in every mare we select) were bigger concerns, but it was curious to find Key to the Mint and Northern Dancer as Great Grand Sires, top and bottom respectively. After making quick work of scanning the mare and foal to make sure no obvious issues appeared, I cleaned the stall and added another bale and a half of straw (it was bedded light figuring we had at least another week) and headed up to the office to send my vet and farm help an e-mail to alert them on the birth. I then grabbed some Novalsan® from the house (to dunk the chord) and headed back to the barn. The filly was up already, but the mare down (very odd for Midge). I was concerned about Midge, but it proved to be just a rest break. When the little gal bounced up again after mom stood (probably 20 minutes after birth), she was up non-stop for more than ½ hour. This is one strong, healthy filly. This spitfire filly is going to be gray (which you won’t see from the video, but the white ring around the eyes and nostril coloring gives it away). Even though a large percentage of Registered Irish Draughts are gray, this will be the first Irish Draught Sport Horse (RID X TB mare) at Halcyon Acres®. If readers are interested, we’ll keep you posted on her exploits. Please indicate in the comments if you want periodic commentary and footage on this first foal of the season (yes, we had a horrid year in 2010 getting mares caught – gave up with one more due in July). If so, we’ll devote some time and space to including you as she comes along.